Skyscrapers is a logical puzzle that I learned from IQFlash.com, a site of online games & puzzles. Imagine a well designed city where all streets are either parallel or perpendicular. The city buildings are arranged in a N×N square of peculiar property: the numbers of floors in the buildings form a Latin square. These are not shown. It is your task to retrieve those numbers. 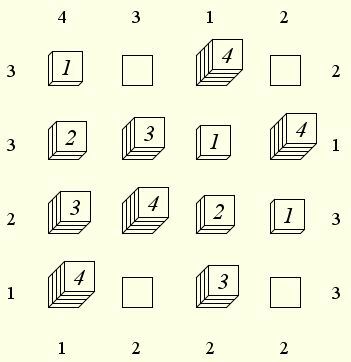 You are given clues: the numbers on the sides of the N×N square show how many buildings are seen from that point in the corresponding (either horizontal or vertical) direction. To produce a number click repeatedly in a square where a building is expected. Undo last: reverses the result of the last click. Restart: returns to the beginning of the current puzzle. New: starts a new puzzle. Store: stores the current configuration of the puzzle. Restore: restores the last stored configuration of the puzzle. Also you may choose to display the numbers, the "skyscrapers", or both.